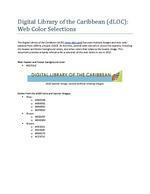 The Digital Library of the Caribbean (dLOC; www.dloc.com) has seen multiple designs and web color palettes from 2004 to present (2013). At this time, several color sets are in use on the website, including the header and footer background colors, and other colors that relate to the header image. This document provides a handy reference for a selection of the web colors in use in 2013.